so with the new year, many resolve to eat better. if by now your resolve is weakening, i have a tip to share with you. i have a big collection of teas that act as dessert alternative. of course, you can also eat fruit as dessert. with tea, however, you won’t have to worry about spoilage or pesticides, and some flavors come closer to a genuine dessert than fruit can. unsweetened, they’re also a calorie friendly way to indulge and can provide health benefits such as boosting your antioxidants and metabolism. rooibos tea also has a high mineral content. i used to love Teavana, until i realized a lot of their flavored blends contained artificial flavors. so i began my search for purer teas that use natural flavorings instead. below are my favorites, many i’m on my second or third bag of. considering i have about 3 Elfa hanging drawers stuffed with tea, you may be sure these are the cream of the crop! none of these need to be sweetened; a few have stevia already incorporated. i’ve grouped by brands in no particular order. Art of Tea hand blends their creations, many of them certified orgranic or fair trade. based in LA, you’ll find their tea in almost every note worthy artisanal coffee shop in LA. trendy restaurants carry their teas too or commission their own custom blends. if you see something you like, they’re currently offering a 21% off site-wide promotion (excluding Tea of the Month and gift cards) until Jan 31st with the code: 21Days. if you live in LA, you can also choose to pick up your order to save on shipping. White Peach: organic white tea (so there will be some caffeine content) infused with peach flavor and accented with osmanthus. this is a delicate tasting tea with fruit and floral notes. Lemon Meringue: lemony and creamy, it really does taste similar to its namesake pie! Brûlée Mint: creamy with a delicate hint of mint. my favorite coffee shop (Copa Vida in Pasadena) makes a great latte with this. i also enjoy it cold brewed (steep the tea in room temp or ice water for 6-8hours) in the summer. this tea won the Best Flavored Herbal Ice Tea award at World Tea Expo. Brewed Awakening is actually a blend of tea and roasted coffee beans. it has a rich taste with caramel and chocolate notes. Tio: apple pie in liquid form. enough said. Olivia: chamomile, mint and vanilla. chamomile and vanilla are the prominent notes in this tea. the mint is mild and provides a refreshing element. Zoe: a green tea with mint, vanilla, and cacao nibs. this is like a liquid andes mint. also makes a great iced tea in the summer. Chai. i’ve tried a lot of chai blends over time, but Sugarbird’s is my favorite. it has just the right amount of cardamom, finely balanced with the other spices. Mountain Rose Herbs is a wonderful source for spices, herbs, and aromatherapy products as well as teas. 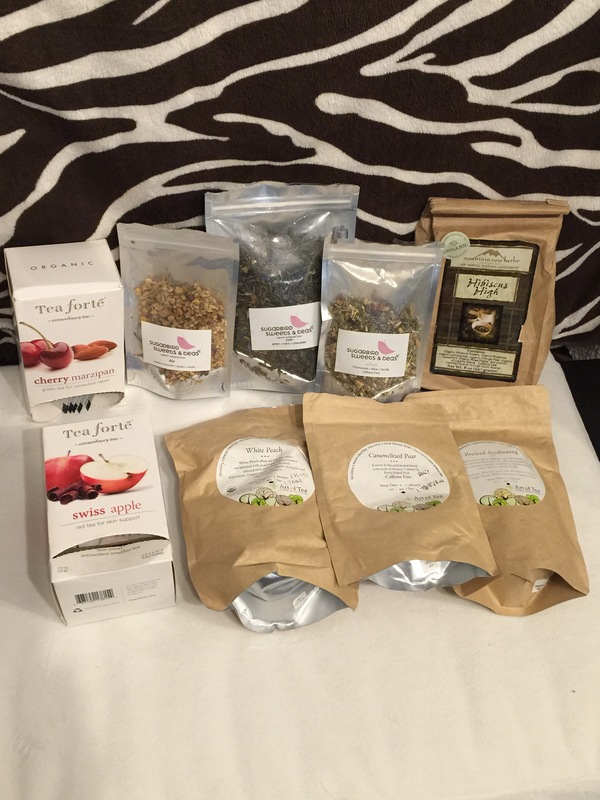 prices are very reasonable, but be forewarned, most of their herbal teas taste… well herbally. i drink many of their teas for health benefits, but the one below is the only one i’d consider enjoyable. Hibiscus High Tea is a refreshingly tart drink and is good whether it’s served hot or cold. this one is one of my boyfriend’s favorite. not only does he enjoy the tartness, hibiscus is also a powerful anti-inflammatory as well as good for lowering blood pressure. Tea Forté may be a brand you’re already familiar with if you follow Oprah or Dr. Oz. it’s also the only brand i know that offers a reward program for purchasing teas. you get 5% of your purchase in reward points that you can redeem for a discount later on. Swiss Apple tastes like cinnamon apples. so that’s it! i hope you’ve enjoyed this peek into my pantry and found a flavor or two that catches your interest. i hate drinking plain water, so in addition to it curbing my dessert cravings, it also encourages me to get the proper amount of fluids. a quick guideline for how much water to drink is taking your body weight (in pounds) and divide by 2. that’s how many ounces you need in a day. divide that number by 8 if you want to know how many cups that equals. you can also tell if you’re dehydrated by the color of your urine. if it’s anything darker than a pale yellow, you need to be drinking more fluids. Readers, what is your drink of preference? how do you deal with sweet cravings? please share! I love rosehip tea and rooibos tea! 🙂 But usually I just drink green tea. Or white, if I can find it. my favorite is green tea. if you like white tea, the peach from Art of Tea is definitely for you! I doubt I can find it here, but you never know! Hey Joy, what a great selection of tea! I find that some of these work against me tho, because they smell sweet without tasting sweet, so I am actually tempted to put sugar in it :p I really like Celestial Seasonings Sleepytime Vanilla, because it tastes smooth and I don’t feel the need to sugar it up! thanks, Sunny! actually a lot of them taste a little sweet from the vanilla and dried fruit. however, a little honey is good for you as long as you let your tea cool down a little bit first so you don’t destroy the enzymes. worst case scenario, a little sugar in your tea is still better than a cookie or icecream 😛 we like Celestial Seasonings Holiday Teas in Candy Cane Lane, Gingerbread Spice and Sugar Plum Spice!